Sir Richard Julian Long, (born 2 June 1945) is an English sculptor and one of the best known British land artists. Long is the only artist to have been short-listed four times for the Turner Prize. He was nominated in 1984, 1987 and 1988, and then won the award in 1989 for White Water Line. He currently lives and works in Bristol, the city in which he was born. Long studied at Saint Martin's School of Art before going on to create work using various media including sculpture, photography and text. His work is on permanent display in Britain at the Tate and Bristol City Museum and Art Gallery as well as galleries in America, Switzerland and Australia. 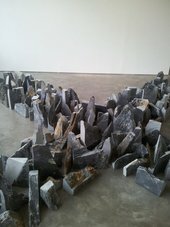 Richard Long: English Modernist or International conceptualist?